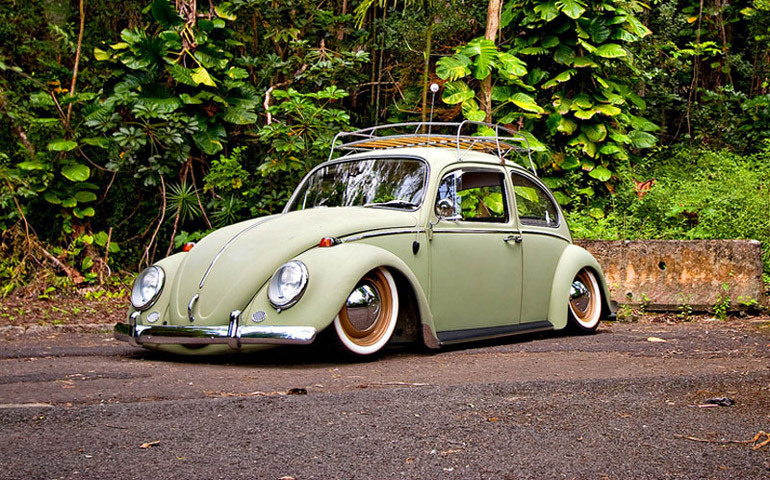 Volkswagen Beetle was originally known as Kafer, a word in German which means "Beetle." The VW then became the most famous small car model in the world due to its superiority in comfort compared to other European small cars and also because of its unique design. It also becomes the generation trade mark style for many decades until now. Adolf Hitler was the inventor of VW Beetle in 1924 while he was imprisoned in jail. He came up with the idea when he was trying to find the solution to the unemployment problem in Germany. His passion in cars, although he never obtained a driving license, definitely played a big part in the idea. With the production of the people's car (aptly named "Volkswagen"), the average man would be able to afford a small, compact vehicle and the government would need to build autobahns as the infrastructure support for the cars. His ideas was proposed as a solution for a fledging economy. Once the Nazi ruled the project was started immediately. There were no other cars which could compete with the momentum the Beetle had seized. No other creators could compete with the comfort, price, and reliability. The Beetle came with 62 mph max speed for 42 miles per gallon, air-cooled engine, and space for 2 adults and 3 children for under $200 market price. In other words, the Beetle had been the support of West Germany economic miracle. VW Beetle also served as a change in trend and style. It symbolized the stability, self-discipline and lust for life. It was soon becoming the best seller in USA and a benchmark for US compact cars. Beetle also ranks fourth in the 20 most influential cars in 20th century. Small variations then took place in 1970's. Super Beetle was launched offering MacPherson strut front suspension. There were also several changes in design and fuel injection system from 1971 to 1976. The 1976's version did not only undergo engineering changes, it also underwent some cosmetic changes mainly in paint and interiors such as adjusted and improved seats, full carpets, blinkers in front bumpers, etc. In complete, the engineering changes in 1976 Beetle were dual port 1600cc engine, rear window defogger, front disc brakes, two speed air fresh fans, elephant's foot tail lights, trim chrome plated, and rubber inserts in the bumper bars. The Beetle stopped being produced in Germany on January 1978. In 1979 the United States stopped the importation of air-cooled Volkswagens. Production of the Beetle continued until 2003 in Puebla, Mexico. German license plates are a necessity. The most common are the long narrow ones that look best on the front bumper. There are square plates that are made and people put these on the decklid where the real license plate should be, (then they put the real plate on the bumper). The square ones are used in Germany for mopeds. Sometimes you can get a matching set of rectangular plates for about $30...that's a sweet deal. Be careful when buying a plate, there are two kinds. The kind that actually came from Germany and the manufactured aftermarket kind. You can tell which is which because the German ones have a reflective coating on top so it can be seen at night. They also have little round stickers on them that will be scratched out. The German government does this when it cancels a plate. The reflecting foil on the plates was mandatory since about 1995. Before that, license plates were also available as non-reflecting plates. Original German plates can be detected by some small engraved logos on the back (and on the top of the reflecting ones.) One of the two plastic stickers (looks the same on both front and rear plates) represents the county where the car was registered, this one will most likely be scratched out. The round colored sticker indicates the date when the car has to go through the next technical control, usually every two years for non-commercial passenger cars. The other one indicates the date for the next smog-check (but only cars after 1969 have to be checked). Usually a set of brand new plates upon registration of the vehicle costs around $40 US. Oval plate isn't as popular, but still cool. They were used when you wanted to export your car out of Germany and into another country. Nowadays, they have a new plate which looks like the original German ones. Switzerland plates are new, at least in Europe. They are similiar to German plates and are a good way to go against the crowd. 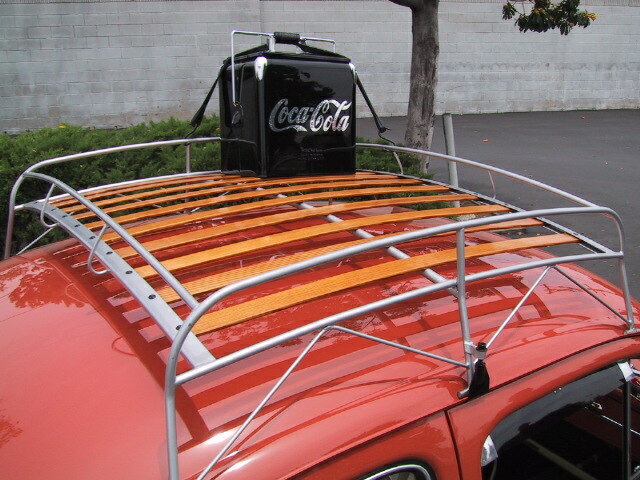 Choosing a VW roof rack for your vintage VW. This great priced reproduction wood slat foor racks can be the finishing touch for your vintage Beetle resto. These great looking racks were a very popular accessory in the 50's and 60's. The unique design of this rack allows it to be shipped by UPS - saving you money! Easily assembled in about 10 minutes with a minimum of tools, screw driver and wrench. Fits all Beetle sedans. 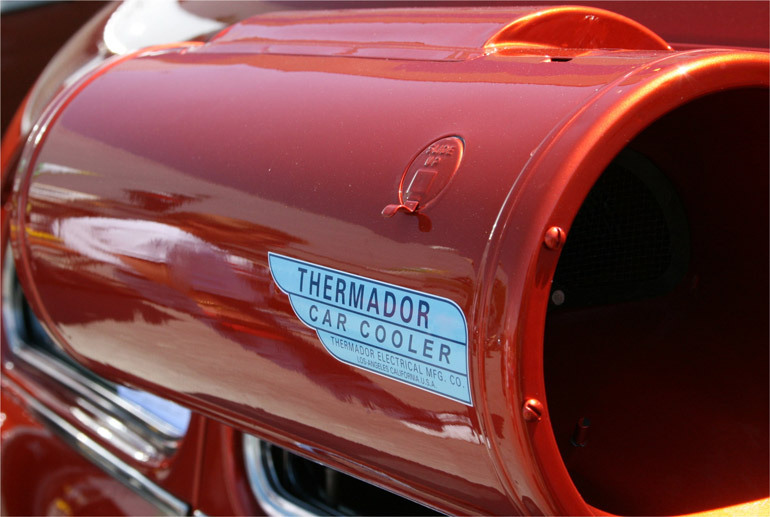 You can't be olde skool without an original thermador car cooler. Basically it's air-conditioning that uses no energy. Inside the big gray tube is a blanket with a string attached that hangs in the passenger window. You fill the tube up with water before you start driving, then every so often you pull the cord. It rotates the blanket inside and dips it in the water. Then air comes through the tube, it becomes cool by going through the wet blanket and finally goes into your car. Obviously it doesn't work in high humidity or when you're at a stoplight. You can find the originals at flea markets, swap meets, VW shows or eBay. These are the VERY best quality EMPI style 5-spoke wheels available, a smooth finish and clean machine work. We have found a new supplier for the well-known EMPI style 5- and 8-spoke wheels. These Volkswagen wheels are closer to the original EMPI wheels made in the 60s. The current American Eagle wheel made in the USA is a poor quality, mass-produced wheel with very old tooling, making for a low-quality finished product. We import these wheels from Europe and they are newly tooled and machined to the highest quality. These wheels do cost a little more, but they are worth every penny. Available in Silver, Black, Polished and Fully Chrome-Plated. We import this very high quality and beautiful BRM replica wheel from Europe. Our BRM Volkswagen wheels come with a beautiful clearcoat finish which will not allow the aluminum to tarnish. Do not use harsh chemical cleaners on these wheels as it can damage the clearcoat finish. The center cap and the wheel mounting bolt kits are sold separately. Center caps are sold separately. We offer two versions of center caps, both have the original SPEEDWELL-BRM logo. One is the flat style which fits most Beetle, Ghia, Type 3s. The other is our extra tall cap, which is designed for the Bus and very early Beetle, which have a very tall center bearing or axle hub which extends beyond the face of the wheel. This wheel is available with polished spokes and black background (with a protective clearcoat) or fully chrome-plated. These Volkswagen wheels are made from an aluminum alloy. Pattern available is 5x205mm Early model Beetle 46-67, Ghia 56-66, Type-3 62-65, Bus 52-70. The JGE Rader Wheel are the most beautiful ALL ALUMINUM reproduction EMPI Rader wheel available! This is a reproduction of the EMPI Rader wheel originally available in the sixties. This beautiful Volkswagen wheel is one piece monoblock aluminum with a ribbed spoke and a chrome centercap. The wheel is JWL and VIA approved. The Rader wheels are much lighter in weight and are a far better quality than any other similar reproduction on the market. They are available in four finishes: Fully Chromed-Plated, Polished Aluminum, Gunmetal Grey (with clearcoat) and Silver (with clearcoat). All wheels come equipped with a chrome center cap. Mounting hardware is sold separately. 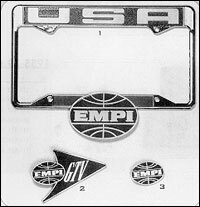 EMPI license plate frames were originally produced back in the day when EMPI was big. Today most of these originals are hard to find and are expensive. To make sure it's an original, look at the back of the frame. The originals are two pieces welded together aftermarket frames are just one piece. Pulling torsion bars is not recommended. 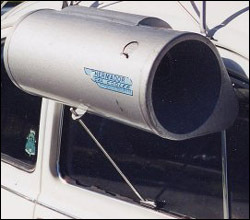 It weakens your beam and can cause it to snap in two which is not fun while you are driving down the road. I would advise adjusters, dropped spindles or an adjustable beam to lower a Volkswagen Beetle. These will lower your ride by 2.5 inches. They don't mess with your beam at all. You exchange your regular spindles at a volkswagen parts place for ones that have a plate welded on them that make the wheel sit at a different position so it is lowered. Ride quality stays the same which is nice. They cost around $200 and you will have to pay extra if you want to keep your regular spindles. I was told that welded spindles will break and that good spindles are forged, not welded. This allows you to not have to pay a core charge since you are buying whole new spindles, not remanufactured ones. Mine were welded and they have stayed together pretty good so far. So the choice is yours. Adjusters can be bought for around $15 for cheap ones or $50 for good quality Berg adjusters. These are then welded onto your beam fairly cheaply...around $30-$50 for a mechanic to do it. They allow your beam to be adjusted up to 4" for higher or lower riding height. The only offset is that they make your ride VERY bumpy. You will feel every little pebble that you drive over and I am not exaggerating. But that's a small price to pay for a slammin ride, right? They are available in both Link Pin (49-65) and Ball Joint (66-77). 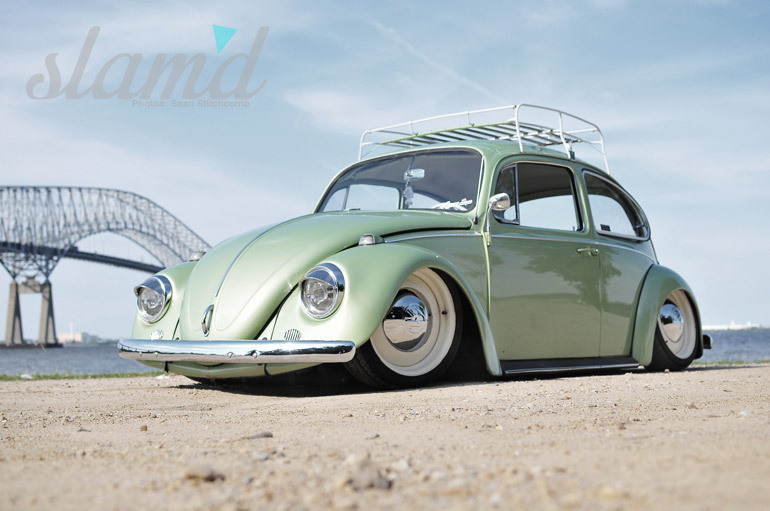 Adjustable beams are around $130-$160 and they allow you to lower your Volkswagen Beetle up to 5.5 inches with stock shocks, and up to 6.5 inches with short shocks. Adjustable beams still ride rough, but if you have the dropped spindles too it won't be that bad. I would also recommend getting caster shims and longer beam bolts if you go down real low. They are available in Link Pin (49-65) and Ball Joint (66-77). They also have 2" Narrowed Adjustable Beams if you go down real low and need extra clearance for wheel turning. If you REALLY want to olde skool it, fill up some sand bags and throw em in your trunk. Bags of dog food, bricks, and bags of cement also work good. Your gas mileage will be horrible, but if you're on a budget it's an excellent idea. And anytime you want to go back to stock height, just take them out. I actually know people who do this, so don't blow this idea off! As for the rear end being lowered, that is just a simple procedure that includes rotating the torsion bars. How far they are rotated determines how low you want to go. You can get this done at an auto shop for around $70-$90. or if you want to do it yourself don't rotate more than 2 splines, it would be too low and you would bottom out after going over every little rock in the road. This is all I know about the rear end, if you want more info please contact your nearest VW mechanic. 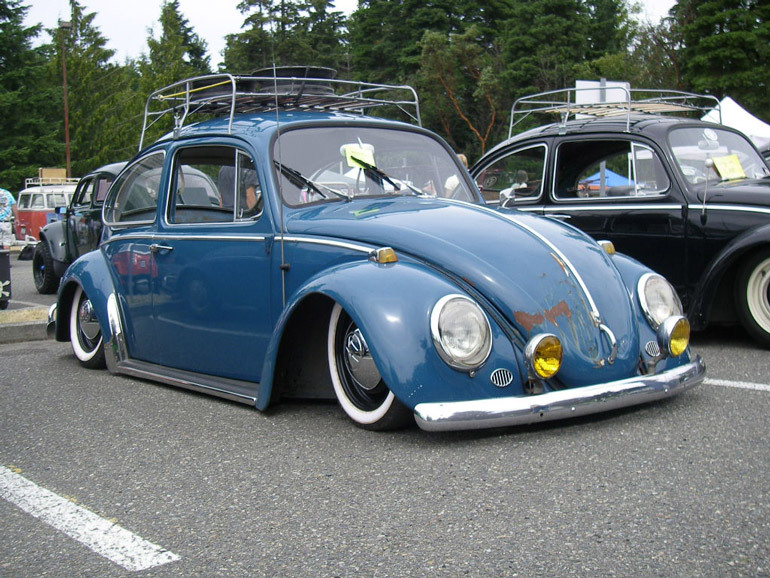 If you lower your Volkswagen beetle over 2.5" you will have to get smaller tires in the front. 165's are stock, most people go for 135's. If you lower the back, get some 145's for the rear. Expect your front tires to rub the fenders when you turn, this is normal. If you go way down you should probably also get your beam narrowed so you'll be able to turn the front wheels. Again, I'm not sure of the procedure so contact your VW mechanic. Old: adjective. No longer in general use. School: noun. Any group of persons having common attitudes or beliefs. Olde Skool: A following of VW owners who say a VW can never be too low, too loud or too old. Volkswagens proudly displaying their old school heritage of roof racks, Coke coolers, Thermadors, and EMPI rims. Olde Skool Volkswagens. Pre-67 vintage aircooled VWs.